This lesson involves students formatting a spreadsheet so that it is a workable math app. Students are more than aware of what apps look like and what they can do. By applying math formulas in spreadsheets, students can get an introduction to design and coding, and get a chance to apply their math knowledge to something someone else might actually use. This is an easy project I thought of when my class had some time to fill. Of course, it helps if they are already familiar with working with spreadsheets, but if not - it doesn't take too much time to get up to speed. 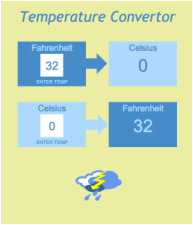 The assignment was to create a spreadsheet page that would calculate temperatures in degrees Fahrenheit to Celsius, and vice versa. They needed to make sure that their formula would follow the order of operations correctly. In this case, this was accomplished simply enough by designating a cell for the user to enter a temperature, and then targeting it in another cell with a formula, such as "=(C6-32)*5/9 ". Students get really engaged when they start exploring the design elements of the project. What colors should they use? What font size is appropriate? Are the dimensions appropriate for a cell phone's or tablet's screen? What should it look like if the device is rotated? What would make a good title? Are there functional buttons that should be added? The design aspect of the activity is the main reason why I've included it with Project Based Lessons. From the commercial side of app markets, to refining their product, there are many ways you can approach this and extend it further. Most math formulas or functions should be appropriate for the task. The area of geometric shapes would rely on values entered in several cells and an approximate value for pi. Use the activity to investigate how math formulae can be devised; for instance, the relationship between the area formulas of a parallelogram, triangle, and trapezoid. Use proportions to develop the conversion formulas for temperature. On a deeper level, have a class discussion on the usefulness of formula apps and whether it's important for someone to remember a formula or not. Spreadsheet applications are very versatile tools that can be used in many ways. If you are unfamiliar with them, the best way to learn is to create one and explore what you can do. Each time you'll learn something new; if there's something particular you want to accomplish, you can usually find the answer online or from other users. A spreadsheet page is filled with boxes or "cells" that are arranged by columns in letters and rows by number. A cell is identified by the row and column it lies in; for instance, "B10". The size of rows and columns can be adjusted by grabbing the border between them and pulling in the desired direction. You'll find many familiar word processing functionality such as color, font size, and so on. If you want to perform a function, then you'll type an "=" sign in a cell followed by the function. For example, type "6" in B10, "8" in B11, and "=B10+B11" in B12. Hit enter and the result "14" will appear in cell B12. If you change any of the values in B10 or B11, you'll find the sum is automatically adjusted. There are some differences in the math symbols you'll use. The asterisk * is used for multiplication, carrot ^ for exponents, and back slash / for division. The activity Crop Circles 2 has additional instructions in the download for Teachers for applying math formulas in spreadsheets. When students are finalizing their "apps", have them go to the View menu and select to hide gridlines for a cleaner appearance.